Cornwall's rugged coastline with its secluded coves provided a haven for wreckers and smugglers, which experienced its heyday during the eighteenth century. The coastal town of Perranporth had a syndicate of smugglers, while the Dolphin in Penzance was a popular meeting place for smugglers. 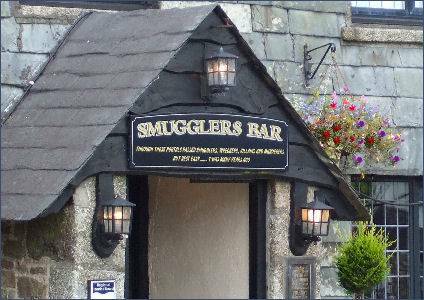 The Ship Inn at Porthleven was also once a smuggling inn. It is said to have had secret passages, although none have been discovered. Tunnels are also to be found at Gunwalloe Cove, on the Lizard, which once led from a cave by the beach to the village church of St. Winwaloe. Treasure hunters have found coins from shipwrecks beneath the sand on the beach. One of Cornwall's most famous smugglers, John Carter was born in 1738. His nickname derives from a childood game of soldiers he often played with his brothers Francis, Harry and Charles, John would take the role of the contemporary King of Prussia, Frederick the Great. The nickname stuck. It appears Carter was equally as charismatic as his hero and his nickname rechristened Prussia Cove, on the coast of Mount's Bay. (pictured left) Carters' exploits include firing cannon at Revenue shipping, breaking in to Revenue premises but taking only his goods which had earlier been expropriated. 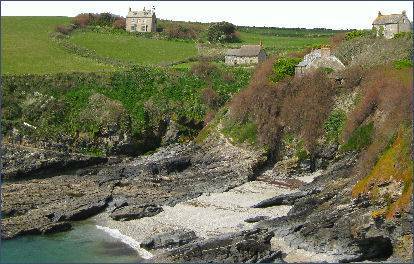 The Carter's operated from three small inlets, Pisky's Cove on the west side, Bessie's Cove and King's Cove. Numerous clashes took place between John Carter and his brothers and the Customs men, the Carter brothers stationed a battery of guns on the cliffs above the cove. Many of which are documented in a colourful autobiography written by these exploits have been recorded by Harry Carter, who later reformed and became a preacher. John Carter acquired a reputation for honest dealing among the smuggling fraternity. One tale relates how he broke into the custom house at Penzance to regain some confiscated tea which was stored there. His companions were reluctant to aid such a risky venture, but John explained that he really had no other option as he had promised to deliver the tea by a certain date. The excisemen, returning next morning to find the custom house ransacked commented 'John Carter has been here, and we know it because he is an upright man, and has taken away nothing which was not his own.' Harry describes many of the Carter's exploits in his book. An ill-fated smuggling trip almost resulted in his death. As he guided his vessel into the harbour at Cawsand, Harry assumed that the two small craft which drew alongside his were preparing to unload his cargo of contraband. Too late it dawned on him that they were actually from a man-of-war, and a fierce battle with the authorities ensued. Harry was struck to the ground in the melee and left for dead, but after several hours had passed, his body remained warm although 'his head is all to atoms' as one of the guards observed. He managed to crawl across the deck and drop into the water, he was picked up, severely injured, by local men. He relates in the book 'My strength was allmoste exhausted; my breath, nay, my life, was allmoste gone....The bone of my nose cut right in two, and two very large cuts in my head, that two or three pieces of my skull worked out afterwards'. John Carter mysteriously disappeared, presumed dead in 1807. Modern visitors to the Jamaica Inn on Bodmin Moor can relive the smugglers' experience, as the inn boasts one of the finest and most extensive collections of smuggling artefacts in Britain, there is also a display of various items owned by Daphne du Maurier, including her writing desk and typewriter. The inn became a smugglers' stopping point, they are said used many secret routes to move around their contraband.The Jamaica Inn's past notoriety as a pirates' den was known to Daphne du Maurier three years prior to writing her famous book, when she had lived in the inn and drew on this experience experience she had penned her popular novel the 'Jamaica Inn', describing the nocturnal activities of a smuggling ring "portraying a hidden world as a place of tense excitement and claustrophobia of real peril and thrill.". The Museum of Smuggling is situated in the main coaching house. The museum holds a varied collection of smuggling artifacts that is depicted through the history of the Jamaica Inn and the inn's role in this trade for many years. The Cornish coast was the most popular location for smuggling of silks, tea, tobacco and brandy into England. The museum contains various items including 'wanted' posters, one of which dates to 1798, a poster celebrating Lord Nelson's victory at the Battle of Trafalgar, pottery figures of smugglers and villains and a bag of '10 pounds of Jamaican ganja'. There is also a display in the room where Dapne du Maurier stayed which consists of various items owned by the author, including her writing desk and typewriter. The local clergy were not exempt from these illicit activities. Clergymen such as the Rev Richard Dodge of Talland were involved in smuggling and he is reputed to have even spread stories of ghosts, supernatural phenomena and demons in the village to keep observerers from his involvement in smuggling. Rev. Thomas Whitford, rector of Cury in 1739 was actually caught in possession of 4 casks of wine looted from the wreck of The Lady Lucy on the rocks at Gunwalloe. One vicar whose Sunday service was interrupted by the announcement of a wreck on nearby rocks is said to have reacted by asking the congregation to remain seated until he had removed his cassock " so that we can all start fair ". In 1357, during a time of bitter rivalry amongst robbers and ruthless pirates of nearby Widemouth Bay, 'Tis said that any man or vessel that dared cross the great Widemouth sound beneath the tallest cliffs of Cornwall, far below the green, green fields of Poundstock were once at the Cornish pirates mercy.' The assistant curate of St Winwaloe's Church, at Poundstock, near Widemouth Bay, one William Penfound, ill befitting the role of church curate, was a gang member and apparently quarrelled with his unsavoury colleagues, who vowed revenge. As Penfound assisted at Mass in the Church on December 27th 1357 a band of armed men burst into the Church. William Penfound was brutally murdered in the church and his blood splashed upon vestments and altar furnishings. It is said that his restless ghost may still wanders in the vicinity. 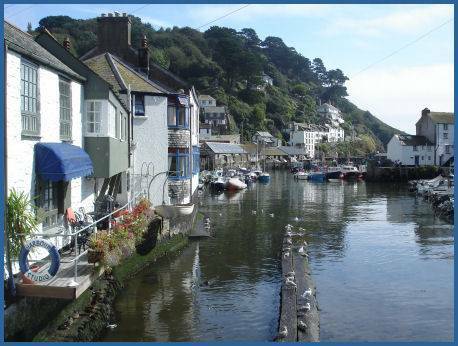 The Heritage Museum of Smuggling and Fishing at Polperro (pictured left) situated in The Warren overlooking the harbour, the Museum houses a remarkable collection of exhibits and nineteenth century photographs as well as many items of memorabilia dating from the eighteenth century when both smuggling thrived in Polperro. Gangs of wreckers operated on the Cornish coast in the early nineteenth century. Cornwall has been very described as the "haven of smugglers"due to its "rocky coves, sheltered bays, tumultuous waves and wild and untenanted landscapes". The wreckers tricked ships to the coast line with the use of beacon lights, which they themselvess installed on the shores of the coast for that purpose. When the ships foundered on the rocky coast they were duly looted by the wreckers. Sir John Killigrew built the first lighthouse at The Lizard in 1619 much to the annoyance of local people who had benefited considerably from wrecking of ships. His actions were not only met with fury but also astonishment, for the Killigrew family were known as some of the fiercest and most notorious pirates ever to sail the Cornish coasts. The infamous female pirate, Elizabeth Trewinnard, Lady Killigrew, was the wife of John Killigrew of Arwenack. In the 1540s, King Henry VIII built Pendennis Castle on Sir John Killigrew's land and made him the first hereditary captain of the castle which meant he controlled all of the shipping in the Falmouth area. However, Sir John used his privileged position to prey on the cargoes of the ships that came within his reach. In 1567, Arwenack House was fortified as a stronghold and used to store merchandise stolen in raids on ships. Elizabeth and her husband paid large fees to harbour and city officials, bribing them to look the other way when carrying out their illicit activities. Elizabeth played an active role in the piracy, and apparently enjoyed the adventure more than her husband. She took a Spanish ship which sought shelter in Falmouth harbour, killed most of the crew and removed its cargo. She and her husband received and stored stolen goods at their home, Arwenack House. In 1582, she was arrested and sentenced to death. Queen Elizabeth I eventually pardoned her, and she was released from prison.